If you‘ve ever walked across a larger street market while on holidays, chances are you’ve seen your fair share of counterfeit handbags, football jerseys and Louis Vuitton scarves. And while most of us are aware of the fact that fake products are a major problem for footwear, fashion and luxury brands, the scope of the problem is surprising nonetheless. 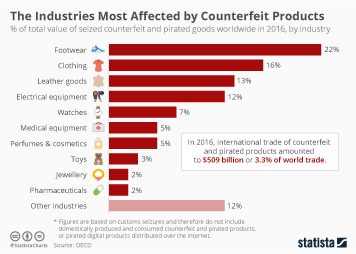 According to an OECD report published earlier this week, the total value of counterfeit and pirated products traded across borders in 2016 amounted to $509 billion or 3.3 percent of world trade. That’s up from $461 billion (2.5 percent of world trade) in 2013 despite the fact that worldwide trade volumes of legitimate goods stagnated over the past few years. 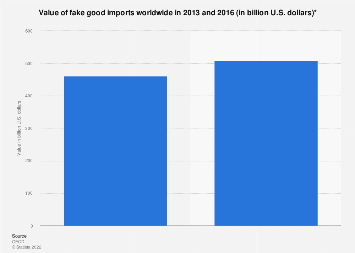 With a combined share of more than 75 percent, China and Hong Kong are by far the biggest provenance countries for fake goods, distantly followed by Turkey, Singapore and Germany who all accounted for a low single-digit share of global customs seizures in 2016. Looking at the countries most affected by counterfeits paints a slightly more diverse picture. 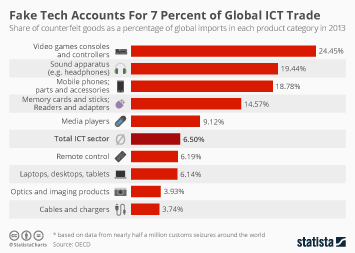 Between 2014 and 2016, 24 percent of the total value of counterfeit products seized by customs around the world were infringing on intellectual property rights of companies based in the United States, with French, Italian and Swiss companies also heavily affected. Interestingly, the vast majority of fake or pirated products seized by customs authorities are shipped as small parcels. 69 percent of custom seizures between 2014 and 2016 were carried by postal or express courier services and 85 percent of intercepted shipments contained fewer than 10 items. 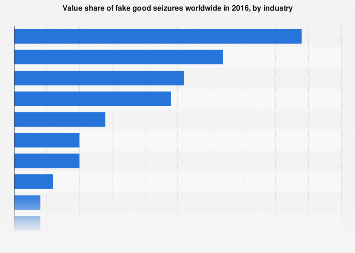 This chart shows the percentage of total value of seized counterfeit/pirated goods worldwide between 2014 and 2016, by country of copyright owner.